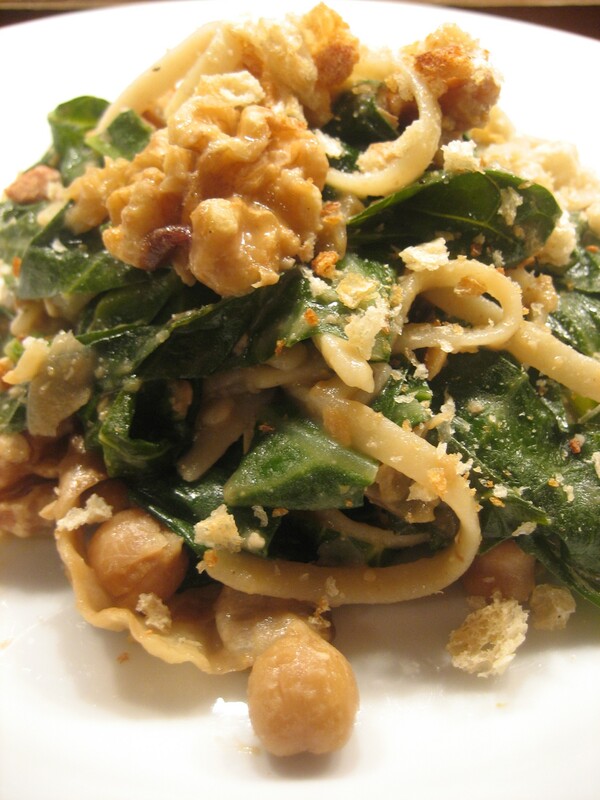 This was such a great way to incorporate greens into a meal on a cold Winter’s night. H told me she’d been craving pasta and this is what I came up with for her. Sauté onions and garlic in a couple teaspoons of olive oil for a few minutes and then toss in the pepper flakes. Add garbanzo beans and some vegetable stock. [I don’t give an amount for the vegetable stock because it’s a matter of taste, if you like a thinner pasta sauce use more stock. Just add it a little bit at a time and if you over-add simply remove the lid of the pan, raise the flame on the stove and reduce it down.] Mash one half the beans in the pan and then add in the ground walnuts and lemon zest. Adjust the volume of sauce to your liking with vegetable stock and then cover and let simmer gently. While the above is happening, have a pot full of salted water heating to a boil for the pasta. Once the water boils, toss in the collard greens and allow them to cook for about 5 minutes then transfer them into the pan with the sauce. Add pasta and cook till al dente. While the pasta is cooking, add the radicchio to the pan with the collards and sauce and fold in. The radicchio will lose that gorgeous purple color turning a warm tobacco brown but will retain that wonderful bitter flavor. When the pasta is ready, strain it and fold it gently into the greens and sauce along with the remaining walnuts and mix well. Sprinkle the toasted bread crumbs onto the pasta once plated for a nice little textural crunch.